Caer Ceri is the second of the three post-Roman British kingdoms to be mentioned in the Anglo-Saxon Chronicle at the date of their conquest. Unnamed in the ASC, Caer Ceri (modern Cirencester) is a later, Brythonic version of the Roman Corinium in the territory of the Dobunni. Its use in this fifth century sense serves to define a territory that probably existed with the city at its core. It would have been bordered to the west and north by an equally obscure territory named here as Caer Gloui. The city at the core of this particular territory appears to have acted as a regional authority which encompassed Corinium until the mid-sixth century. To the east was Cynwidion, while south was Caer Celemion, and to the south-west was Caer Baddan (three more equally obscure Romano-British territories). Corinium was originally a fort which was established perhaps a year after the Roman occupation of the territory in AD 43. The fort was vacated in the mid-70s and the tribal capital of Corinium Dobunnorum was founded in its place, probably under Governor Julius Frontinus. By the second century the city was one of the largest in Britain, and by the third century it was second in size only to Londinium. The origin of the name is obscure. The Roman name was a Latinisation of an earlier Celtic name, but this remained unrecorded, and some sources suggest it might have been Cironion. Post-Roman Corinium seemingly emerged as part of a regional division which included much of the upper eastern shore of the Severn and perhaps even the West Midlands, as High King Vortigern of the Pagenses seems originally to have linked the two together. When Corinium was finally conquered by the West Seaxe, the name was retained, but only in a typically mangled fashion, as Cirenceaster (by AD 900 - within the county of Gloucester). According to Gildas and Nennius when referring to either Aurelius Ambrosius or his son, this family represents the Romanised nobility in Britain. It is possible that by this time, as elsewhere, a magistrate is in charge of the governance of Caer Gloui (and seemingly Caer Baddan and Caer Ceri too, given that the three cities are closely linked). Given the later role of Ambrosius Aurelianus in this region, it seems entirely possible (although hypothetical), that his father now fills this position. Until this decade, the piazza of the forum in Corinium, or Caer Ceri, has continued to be swept clean, demonstrating a clear attempt to retain a degree of civilisation and Roman lifestyle in the town. However, that now ceases and the piazza is abandoned. The timing may be coincidental, but it is in this decade that the growing rivalry between the two opposition factions in Britain erupts into civil war. The city's amphitheatre remains in use in the early fifth century despite similar structures in other cities falling into disuse, probably due to anti-pagan legislation. Caer Ceri lays in an area that has been most notable for its sustained interest in paganism in the previous century, possibly helping the amphitheatre to survive for longer here. 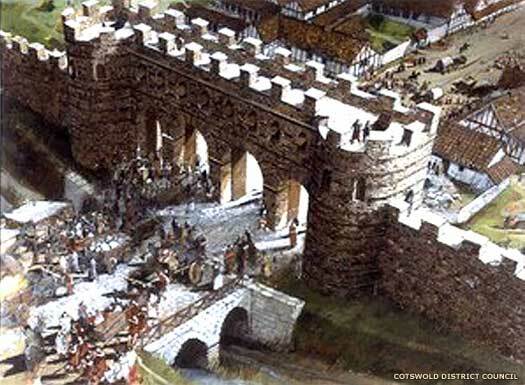 In the early 440s, in conjunction with Caer Baddan, the city's Roman defences are repaired, including the walls. Flood prevention work is carried out on the Verulamium gate. The amphitheatre is reused when a large timber building is constructed within it. This is associated by archaeologists with late fifth or early sixth century pottery, showing that it probably remains in use for at least the next half a century. This work possibly takes place after a revolt by the country's Saxon foederati and laeti, causing widespread chaos and temporarily controlling swathes of the country. That itself seems to occur just before southern Britain is struck by a serious bout of plague, perhaps comparable to the Black death in scale. Unburied bodies are to be found in the streets of Caer Ceri. The town contracts to some wooden huts inside the amphitheatre. It seems likely that the Wansdyke is constructed around this time, possibly in response to further Saxon incursions to the east of Caer Gloui's territories. Groups from the Thames Valley appear to force their way into the western end of neighbouring Cynwidion while further groups from the Middil Engle push through the Vale of Aylesbury to complete the encirclement of that kingdom, exposing Caer Ceri's eastern border in the process. All building and repairs on major new defensive works probably comes to an end with the British victory of Mons Badonicus around 496. Perhaps it is felt, quite rightly, that the threat has been entirely removed for the present. The three cities, Caer Gloui, Caer Baddan and Caer Ceri, still apparently form a single kingdom (called Guenet by Nennius). This seems to be partially borne out when Gildas infers that Aurelius Caninus is ruling his kingdom as a single political entity instead of one of three minor states. Around this time, either upon the death of Aurelius or his successor in Caer Gloui, the single kingdom based there divides into Caer Baddan, Caer Ceri & Caer Gloui. This is probably a result of the kingdom being divided between sons, an act that is based on traditional Celtic practice. The act suggests that a true kingship is being practised by this time, rather than the previous Romanised role of magistrate. Killed fighting the West Seaxe. Caer Ceri's last king is killed as his kingdom fights alongside Caer Baddan and Caer Gloui. All three are defeated by the West Seaxe at the Battle of Deorham or Dyrham. With this collapse, the territory of Caer Celemion to the east is now totally isolated. Corinium, or Cirenceaster as it becomes known to the English by the start of the tenth century, is soon colonised as the majority of the former British territory is subsequently occupied by the Hwicce, who appear to merge with the native population.